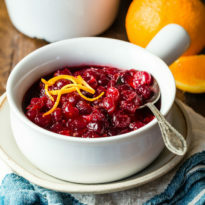 A classic Cranberry Sauce recipe for Thanksgiving. Fresh cranberries are sweetened with orange juice. Perfect with turkey and cooks in just 10 minutes! In a medium saucepan, bring sugar, orange juice, water, orange zest cinnamon, and salt to boil. Stir in cranberries. Simmer until slightly thickened and the berries begin to pop, about 10 minutes. Remove from the heat and allow to cool, about 30 minutes. Cover and refrigerate. This may be made and stored up to three days in advance. Adapted from my Cranberry Sauce with Apples.